Medica’s EasyCell® assistant is designed to help lower costs by reducing the technologist time required to perform manual white blood cell differentials. EasyCell assistant suggests the correct classification of normal cells, allowing the technologist to quickly review the normal cells, leaving more time to review abnormal cells. EasyCell assistant has a 30-position carousel for walkaway operation, increasing efficiency in the hematology lab. A stat position enables a run to be paused for a priority sample. EasyCell Remote Review Software allows technologists to view slides from remote workstations, improving efficiency and allowing for collaboration between multiple sites. EasyCell Competency Review Software permits training and assessment of laboratory personnel by enabling instructors to complete assessments by establishing test sets of reference cell images for new staff, students, and other personnel seeking recertification to review and classify. 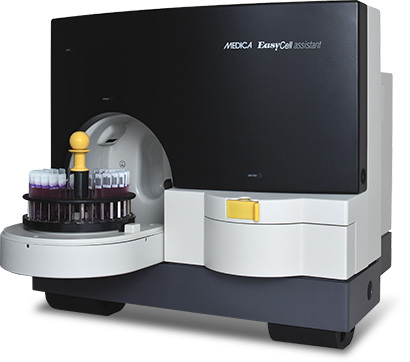 From improving efficiency to assisting technologists with white blood cell differential analysis, Medica’s EasyCell assistant will greatly enhance any clinical laboratory’s hematology testing.